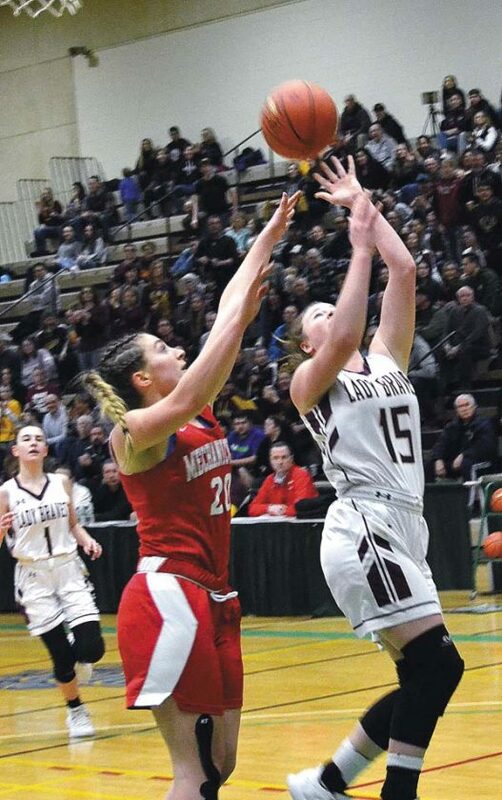 TROY — Halfway through Saturday’s Section II Class B championship game the Fonda-Fultonville girls basketball team found itself with a 22-19 lead over Mechanicville. 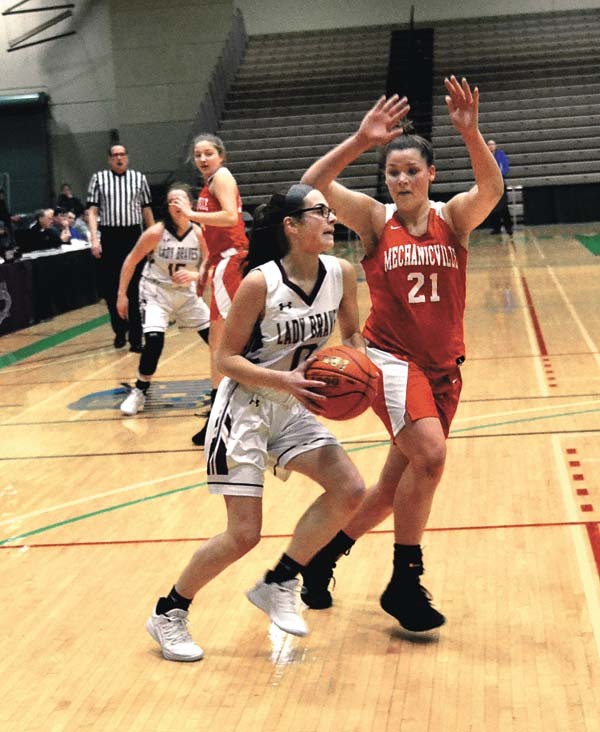 Having knocked off three straight higher seeds to reach the title contest, the 13th-seeded Lady Braves were 16 minutes from another improbable victory – this time over second-seeded Mechanicville. However, the Red Raiders shook off their slow start, outscoring FFCS 37-21 in the second half to claim a 56-43 victory. 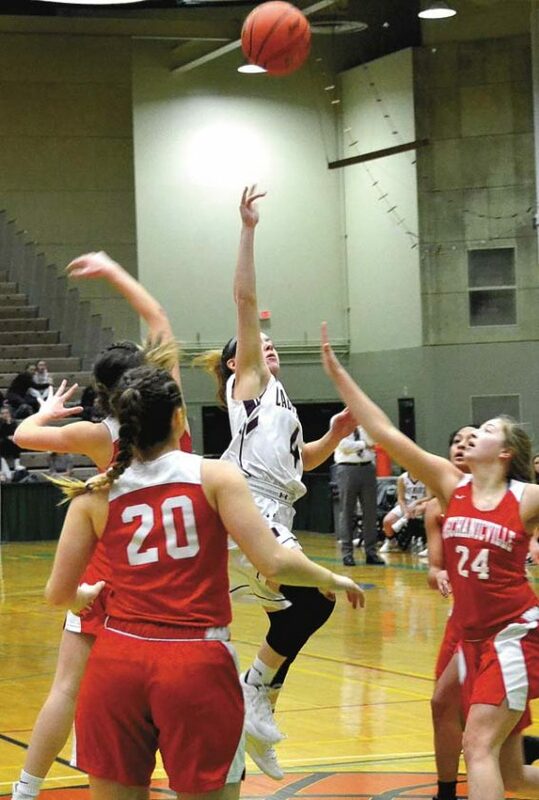 Amy DiSiena, who was named the Class B Tournament’s Most Valuable Player, led the second-half charge for Mechanicville, scoring all of her team-high 14 points in the second half. Charli Goverski finished with 13 points for the Red Raiders, while Jada Brown added 11 points. Abigail Lombardoni had 14 points for FFCS, while Marilyn Whitcavitch added nine points. Both teams struggled out of the gates offensively, combining for just eight points over the first 6:12 of the first half. FFCS outscored the Red Raiders 7-3 in the final 1:48 of the opening quarter to take an 11-7 lead. Mechanicville took its first lead of the game at 12-11 with 5:16 left in the second quarter after a 3-pointer by Taylor Grayson and a basket by Chloe Goverski. The Lady Braves responded with a 11-2 surge to grab a 22-14 lead with 2:08 left in the opening half. Whitcavitch accounted for five of the 11 points for Fonda-Fultonville. Mechanicville scored the final five points of the first half to trail 22-19 at the break. The Red Raiders got going quickly after the break, using a 12-0 run to start the second half. DiSiena scored six points in the outburst for Mechanicville, while Brown had four as the Red Raiders took a 31-22 lead with 4:18 left in the third quarter. Fonda-Fultonville pulled to within 38-32 with 21 seconds left in the third after a 3-pointer by Lombardoni, only to have DiSiena score at the buzzer to make it 40-32 after three quarters. The Lady Braves started the final quarter with a basket by Lyndsay Lombardoni and a pair of free throws from Abby Lombardoni to make it 40-36 with 7:11 to play. Mechanicville didn’t allow Fonda-Fultonville to get any closer, using a 10-2 burst to stretch its led to 50-38. From there, the Red Raiders maintained a double-digit advantage on their way 56-43 win and their first sectional title since 1989. The Lady Braves had plenty to be proud of after knocking off the No. 1, No. 4 and No. 5 seeds on their way to the Class B title game. Mechanicville (17-7) advances to face Section VII champion Northeastern Clinton in Wednesday’s subregional game at Plattsburgh State at 6 p.m.
Fonda-Fultonville finished its season with an 18-7 overall record. 3-point goals: Mechanicville 2 (Cha. Goverski, Grayson); Fonda-Fultonville 3 (Elson, Ky. Smith, A. Lombardoni).